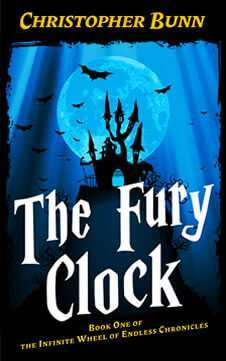 The Fury Clock is humorous epic fantasy, suitable for people who read stories in English (that might change–either the language or the species). Malix Shandy, the best-looking scoundrel in the kingdom, sets off on a hopeless quest to find the dreaded Fury Clock. If he doesn’t find it in seven days, he’ll suffer a fate worse than death. Teamed up with a fairly enormous ogre and a psychotic dwarf, Shandy starts to think maybe death would be restful after a week in such company. Brimming with romance, exciting elves in tight pants, dirty farmboys out to save the world, and tasty roast boar, The Fury Clock will tick-tock your universe into goat-flavored, literary utopia. After all, it isn’t every day you discover the shocking truth about gnomes, dragon eggs or Instant Boots.